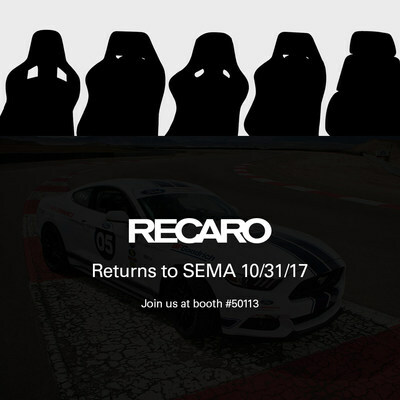 Recaro Automotive Seating, the global leader of performance car seats with more than 50 years of heritage in the seating business will be back to Las Vegas: At SEMA 2017, the premium seat manufacturer showcases new seats for the US aftermarket at its booth 50113 in the Performance Pavilion. Adient's product group is not only revealing four product premieres for distinctive driving fun, Recaro will also have seats in numerous show cars all over SEMA. Visitors can join the "Recaro Rally @ SEMA", find the Recaro seats and win fascinating prizes. LAS VEGAS, Oct. 9, 2017 /PRNewswire/ -- "To be back at SEMA after a couple of years is a great opportunity for us to underscore our long standing relationships with the leading auto manufacturers in the US," says Martin C. Klein, vice president of Recaro Automotive Seating. "We see our SEMA appearance as a strong signal to the American car enthusiasts scene, following a growing customer demand to strengthen our engagement on the US aftermarket. That's why we will surprise our fans with a brand new set of awesome Recaro seats at the show." For more specific information, Recaro Automotive Seating has launched a special microsite under www.recaro-automotive-sema.com. Over the coming weeks the site will provide details about the new RECARO products, details on the pre-order process, a dealer search and a link to the online store for Recaro seats in the US. But first of all, fans can apply for a chance to win an unforgettable experience: Recaro Automotive Seating and the Ford Racing Performance School have joined forces for SEMA 2017 – and the winner will enjoy one day of high performance driving instruction at the Ford Performance Racing School. Recaro Automotive Seating is a product group of Adient. At seven locations in Germany, Poland, Slovakia, Japan, Mexico, and the USA, we design, manufacture, and market complete seats representative of our core competencies of design, ergonomics, craftsmanship, robustness, lightweight construction, and first-class workmanship, under the brand name Recaro. Recaro Automotive Seating consists of two units: While Recaro Performance Car Seating offers passenger car seats for OEMs and the aftermarket, Recaro Commercial Vehicle Seating focuses on commercial vehicle seats in the OEM and aftermarket segments. Recaro Automotive Seating uses the brand Recaro under a license of the Recaro Holding. Adient is a global leader in automotive seating. With 75,000 employees operating 230 manufacturing/assembly plants in 33 countries worldwide, Adient produces and delivers automotive seating for all vehicle classes and all major OEMs. From complete seating systems to individual components, the company's expertise spans every step of the automotive seat-making process. Adient's integrated, in-house skills allow it to take products from research and design all the way to engineering and manufacturing – and into more than 25 million vehicles every year. To learn more, please visit adient.com.